Abstract: Extramedullary plasmacytoma (EMP) is an infrequent form of plasma cell dyscrasia that presents as a mass of monoclonal plasma cells located in extramedullary soft tissues with no skeletal component. EMP constitutes ~4% of all plasma cell neoplasms and occurs mostly in the upper respiratory tract. Here, we report a rare case of multiple EMPs involving the trachea, laryngopharynx, and oropharynx, which caused symptoms of airway obstruction as the only clinical manifestation. 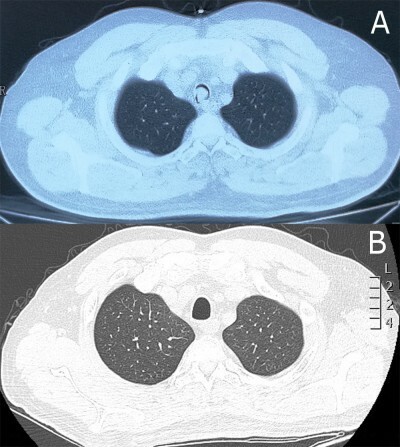 The patient was diagnosed by histopathology of the tissue from bronchoscopic resection and successfully managed with bronchoscopic intervention to treat lesions in the trachea and radiotherapy combined with surgical resection to treat lesions in the pharynx. There was no recurrence after 14 months of follow-up. Endoscopic intervention plays a key role in the rapid diagnosis and treatment of EMP involving the central airways.